Karnataka PGCET 2018 Results, Rank card released on August 19th : The eligible candidates has appeared for the Postgraduate Entrance Exam conducted by Karnataka Examination Authority on 15th July 2018 for MBA and M.E/M.Tech./MCA/M.Arch courses. Now, the results of PGCET 2018 are released on its official website @ kea.kar.nic.in. 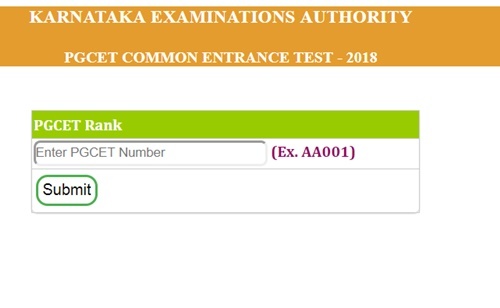 Candidate can find the details of score card with rank in the results of Karnataka PGCET 2018. The list of the candidate names who met the cut-off mark set by the board and qualified will be listed in the merit list, the rest of the candidates who didn’t find their names on the list are not allowed for the further process. KEA has released the two merit lists, one for PGCET Qualified candidates and one for GATE Qualified applicants. You can check KEA PGCET Merit List from the official website kea.kar.nic.in. The merit list is prepared based on the cut-off marks set by the board, category and candidate can check the cut-off marks and also the merit list in the official web portal of the board. Scoring more in the test has more opportunities to choose the best Postgraduate College for admission.The candidates must have passed the B.Tech/B.E. degree with a minimum percentage of 50% (45% for reserved category candidates) to appear for the Karnataka PGCET 2017. As per the university the following courses are offered by the participating institutes under Karnataka PGCET 2018. The courses are divided into two parts as mentioned below. Part A – These are the courses which are offered by the institutes affiliated with VTU, UVCE and UBDTCE Universities. Part B – Courses offered by Kuvempu and Mysore University. Candidates after checking their results will go for further rounds where they will select the colleges that are available as per the merit list and the rank they have secured in the examination and proceed for documents submission for the college there have selected. At the time of verification of documents candidates are supposed to submit the documents for verification, The below listed documents should be carried during the verification by the candidate. When u ll be going to the announce the date of verification of document. Even I have d same problem…..I don't know what to do and y it happened…….is dere any solution……. what is the GATE score of the person who got rank 1 in EC in PGCET? If i forgotten to download & do Xerox of the allotted seat results in pgcet…. Hw can I download it again sir ?? Plzz can anyone tell d procedure?? Bcoz now d results link closed …wt shd I do to download? When u will be going to announce the MERIT LIST? I am also having same dout!!! Download , last years mba or mca or whichvr streams merit list & cuttoff pdf’s & u ll cm to know..
Download pgcet brochure.. u ll cm to know evrythng. . Thanks to this website, we all at least got some information by discussing. Now that the results are finally out, guys everyone drop your rank, and tell which clg u r trying for.